Ernst L. Freud (1892–1970) was a son of Sigmund Freud and the father of painter Lucian Freud and the late Sir Clement Freud, politician and broadcaster. After his studies in Munich and Vienna, where he and his friend Richard Neutra attended Adolf Loos’s private Bauschule, Freud practiced in Berlin and, after 1933, in London. Even though his work focused on domestic architecture and interiors, Freud was possibly the first architect to design psychoanalytical consulting rooms—including the customary couches—a subject dealt with here for the first time. 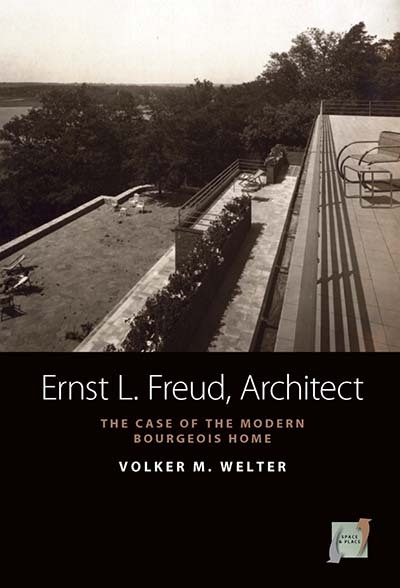 By interweaving an account of Freud’s professional and personal life in Vienna, Berlin, and London with a critical discussion of selected examples of his domestic architecture, interior designs, and psychoanalytic consulting rooms, the author offers a rich tapestry of Ernst L. Freud’s world. His clients constituted a “Who’s Who” of the Jewish and non-Jewish bourgeoisie in 1920s Berlin and later in London, among them the S. Fischer publisher family, Melanie Klein, Ernest Jones, the Spenders, and Julian Huxley. While moving within a social class known for its cultural and avant-garde activities, Freud refrained from spatial, formal, or technological experiments. Instead, he focused on creating modern homes for his bourgeois clients.